You are working on what is a relatively small spreadsheet (couple of hundred rows, not many sheets), but you find that a sheet or sheets within the spreadsheet are extremely slow. A client recently experienced this and we tried a few things to speed it up. Excel Sheet Slow- what are you not seeing? We discovered (using GOTO Special- Objects) that on this one slow sheet, there were hundreds of ‘blank’ picture links. If you are unaware of what a Picture Link is, it allows you to Copy and Paste as a Picture Link an area of the spreadsheet. Useful when building dashboards but it is processing heavy (especially on Apple Macs). 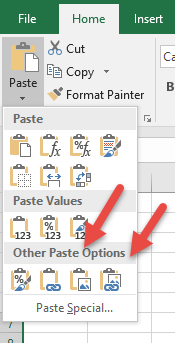 If you paste as a picture, Excel just pastes a picture, but a picture link keeps monitoring the area you copied. Because of the way it is set up in the Paste Special dropdown, it is easy to accidentally choose the link rather than the picture. As shown below, the one on the left just pastes a picture, the one on the right pastes a link. In the client example, blank cells were copied and pasted as picture links all over the place. As a result, you could not see all these objects but Excel was working hard to show in these pictures blank cells elsewhere. Once deleted, the sheet went back to normal speed!